That left runners at the corners for Lee Jae-won, who moved up a spot to bat fifth after hitting .417 in the first three games. Sands put the Heroes on top by 2-0 with a two-run homer in the bottom fourth. It was Sands' second home run against SK starter Moon Seung-won in as many games. Moon made a relief appearance in Game 1 last Saturday and Sands jumped on a hanging slider for a three-run blast then. On Wednesday, Moon left another slider over the fat part of the plate, and Sands didn't miss it. His frozen rope shot just cleared the left field fence, and gave in-groove starter Lee Seung-ho some breathing room. Lee was pulled after walking the first batter of the fifth inning, and the Heroes' bullpen, which shut down the Wyverns over the final 3 2/3 innings Tuesday, stepped up once again. An Woo-jin, another 19-year-old pitcher, struck out the side in Lee's relief, all with sliders. With the men at the corners, Lim Byeong-wuk attempted a squeeze bunt. But the ball stopped just in front of the right batter's box in fair territory and catcher Hur Do-hwan picked it up easily and Seo Geon-chang, the runner coming home from third, was caught in a rundown. 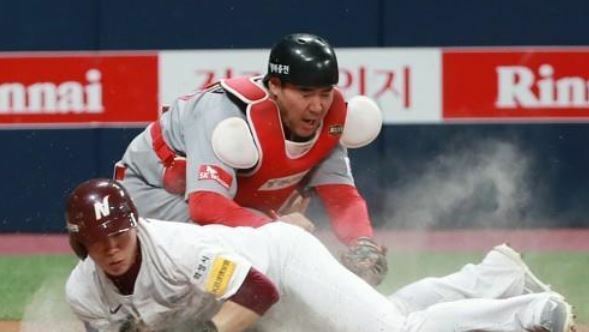 But third baseman Na Ju-hwan, after receiving the ball from Hur, lost his footing and fell to his knees, and his throw home went off Seo's body and rolled into the backstop. SK's Han Dong-min, mired in a 1-for-15 slump, hit a two-run homer in the top of the ninth to cut the deficit in half. Kim Kang-min's two-out double brought the tying run to the plate in the form of pinch hitter Jung Eui-yoon, who flied out to center to end the game. "This feels good. It's great to get a win and we're going to Game 5 with a little bit of momentum," Sands said. "Some days, the team's going to get 10 hits and I'll get none. This is one of those days. We won the game and that's all that matters." Of his home run, Sands said he wasn't sitting on a slider from Moon, and simply reacted to that pitch when he saw it. "I wasn't sure if he was going to throw it to me again or not,"
said Sands, who saw four fastballs and one curve before that slider in the at-bat. "I wasn't necessarily looking for it."